Sorry. I've been so busy lately that I don't have time to crochet. I missed crocheting. I feel bad. Anyway, last night I made a simple scallop bracelet. So simple and I know everyone can make it. You can play around with colors and sizes. Mine was made of thread and a tulip steel hook size 1.5 mm. 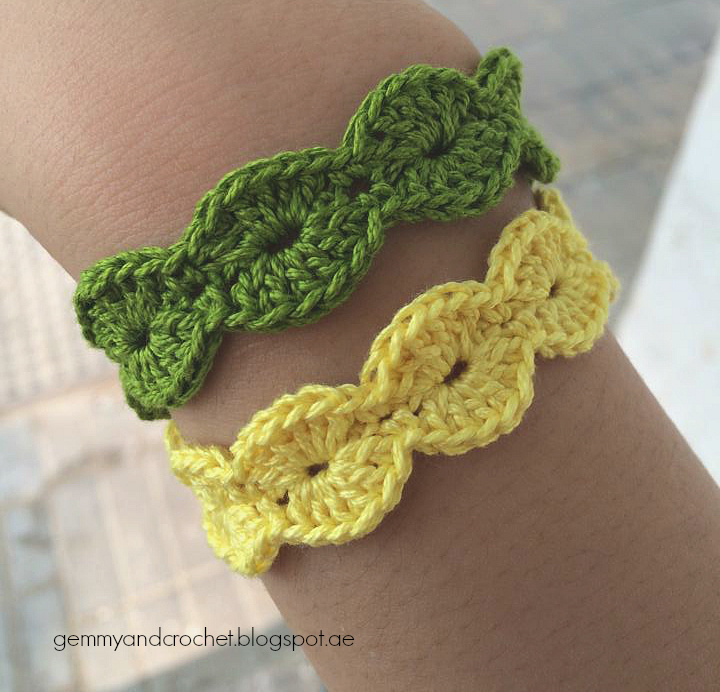 I made two colors; yellow and green. Chain 10. 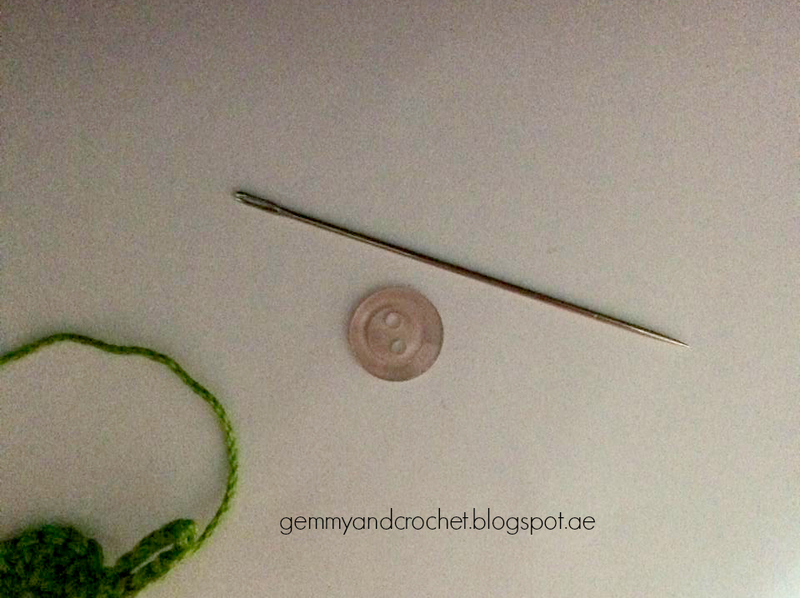 Slip stitch to make a ring for the button. Chain three. Next. Chain again(Multiple of six) Last is two chain stitches. Mine was 3 + 54 + 2 = 59 chain stitches. Foundation is finish. Let's move on for the scallops or the circle part of the bracelet. 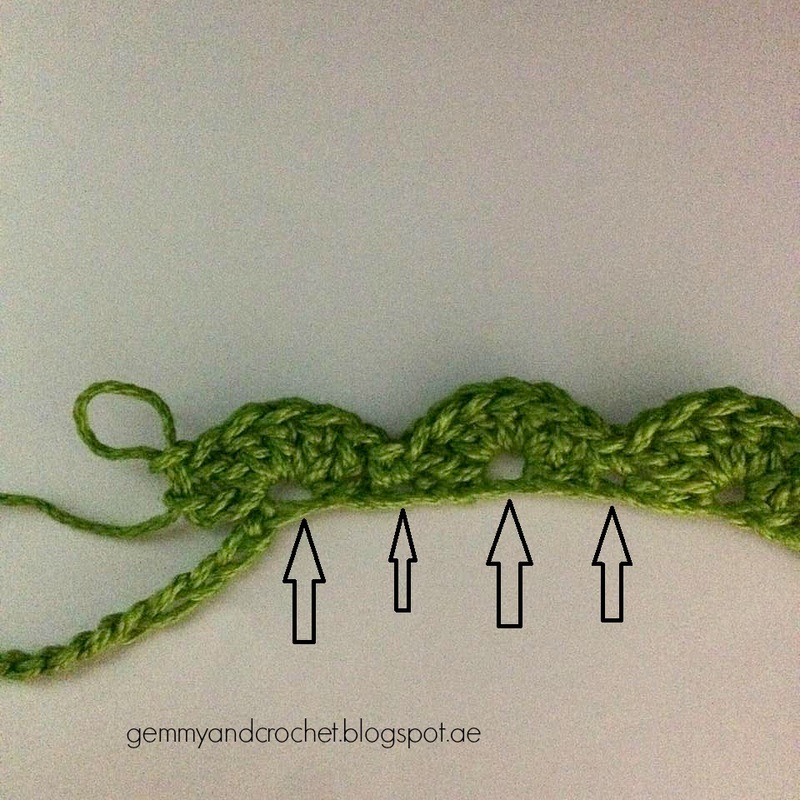 Double crochet in the third stitch away from the hook. 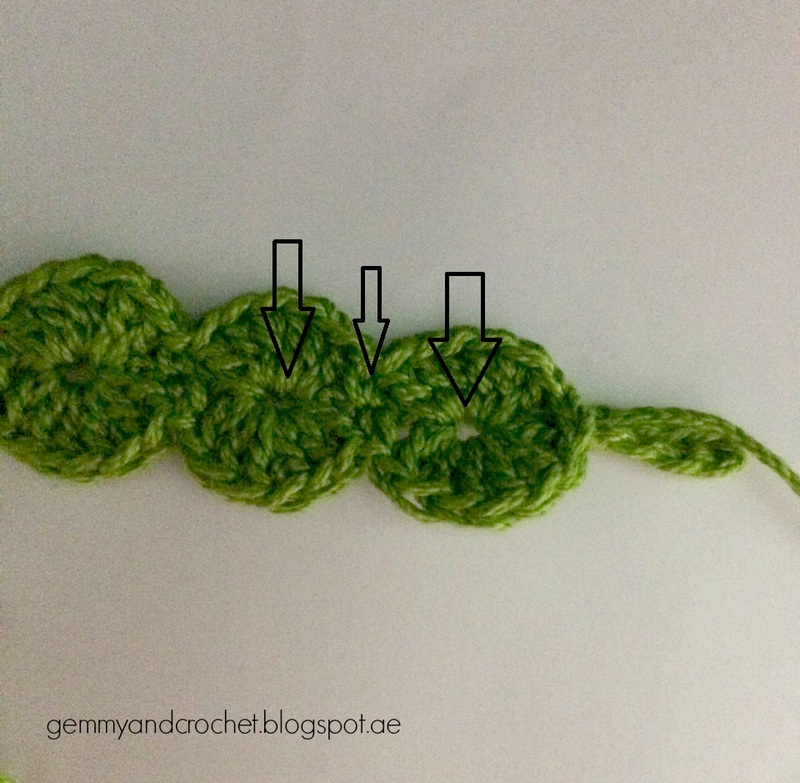 In the same stitch, it should have six double crochet. Skip 2 stitches. 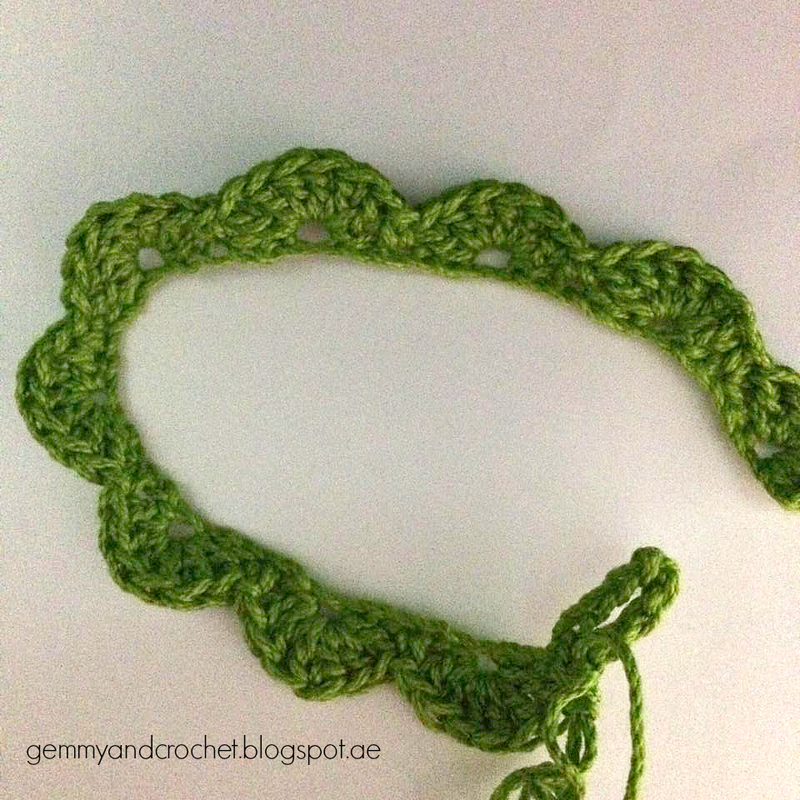 Single crochet. Skip again 2 stitches. 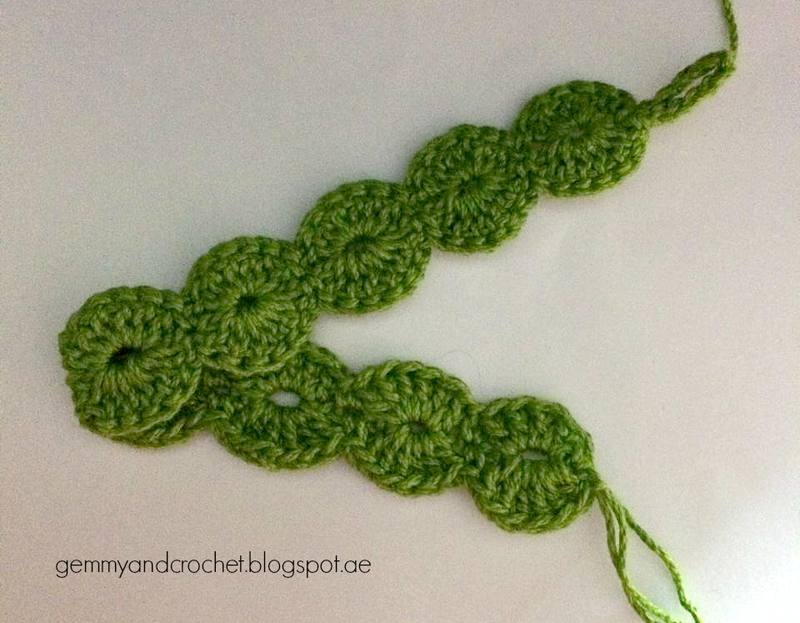 6 double crochets. Repeat for the whole row. 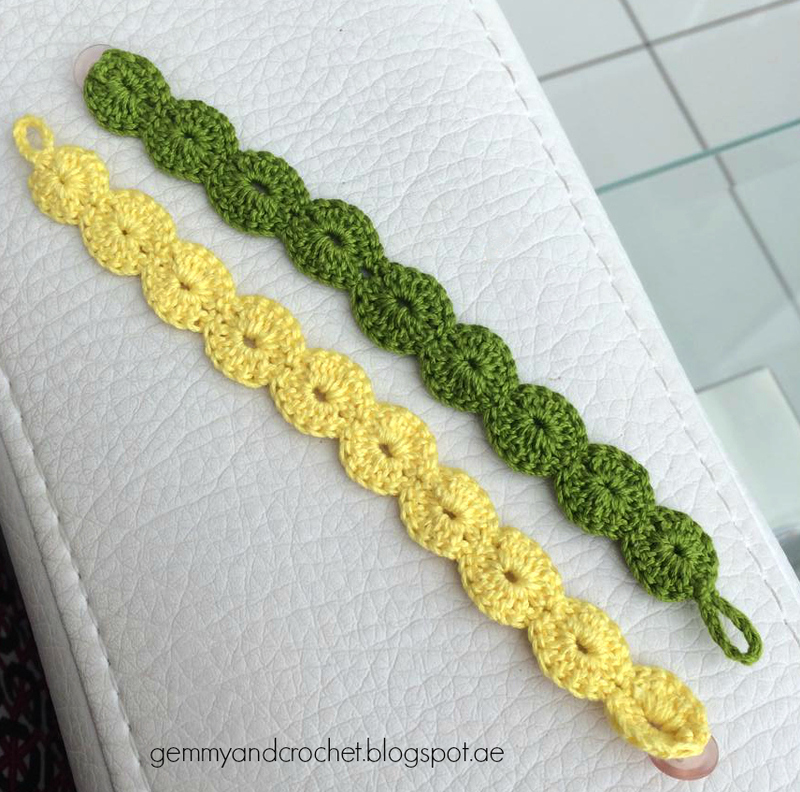 To complete the bracelet. Turn the work. Doing the last row. Do the same thing in the half circle. 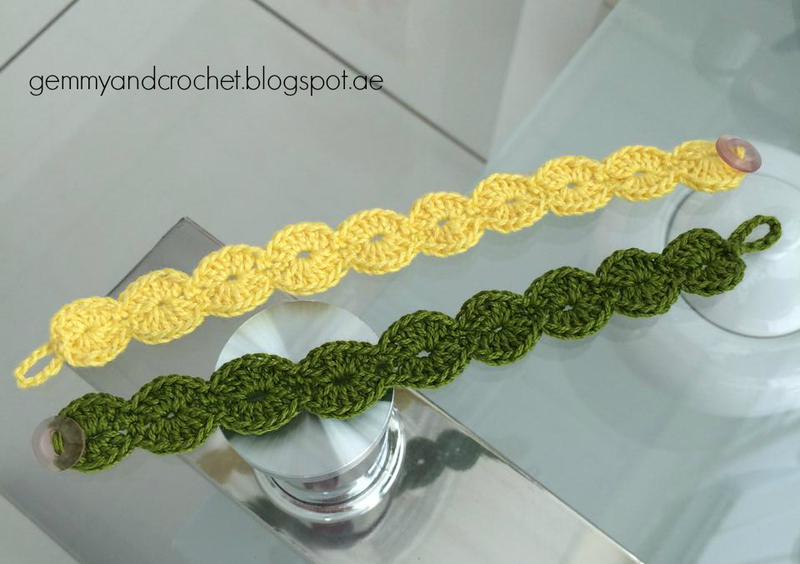 6 double crochets. Skip 2 stitches. 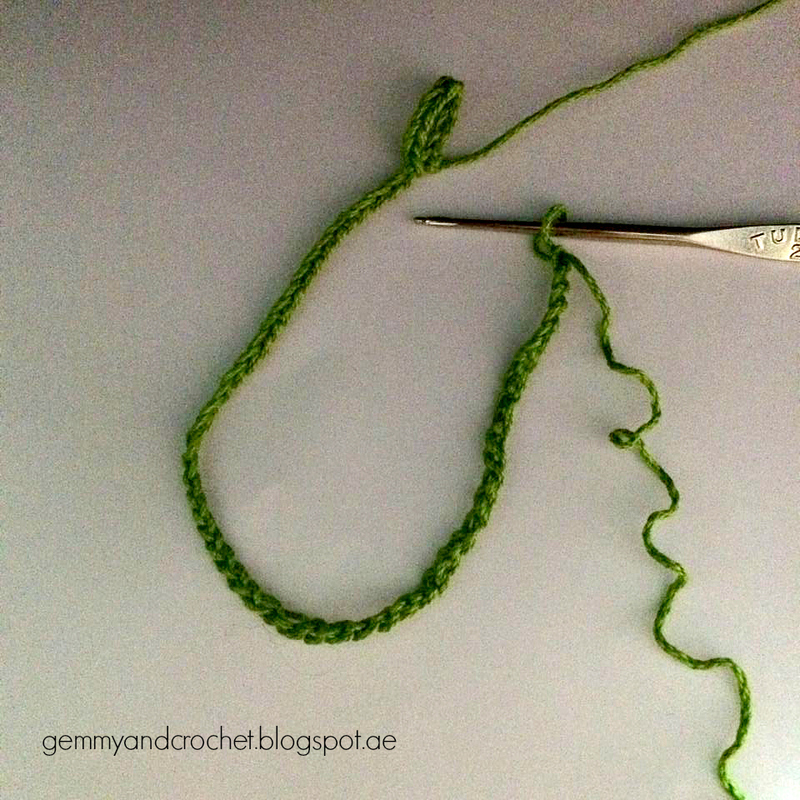 Single crochet. Repeat to finish the project. So everything is almost done. 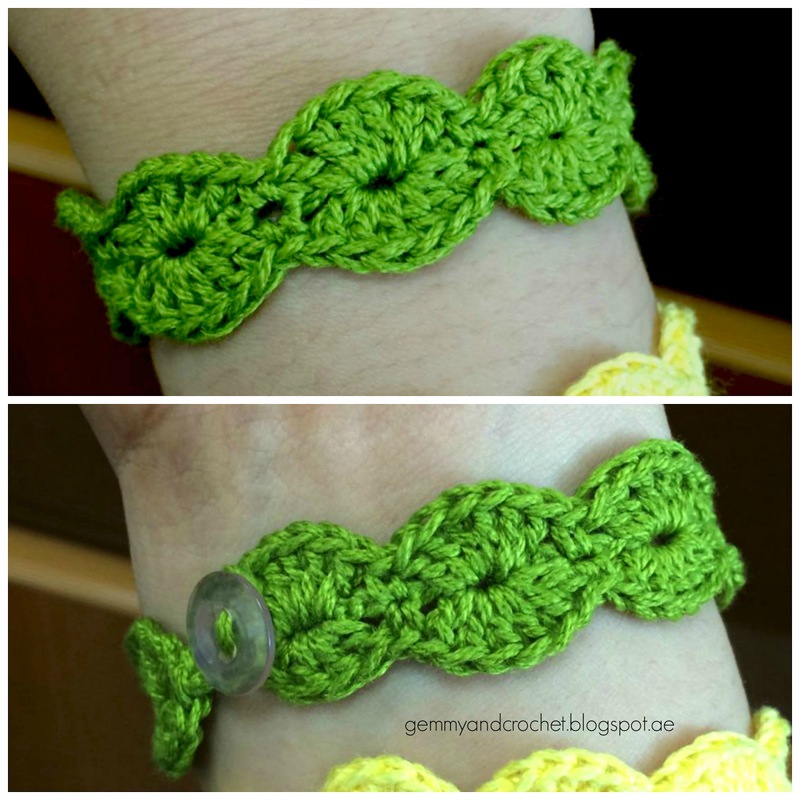 Sew the button to the opposite end to use for the bracelet lock. Foundation chain is multiples of 6 plus 5. In 3rd ch from hook, DC 6 in same st, SK 2, sc, SK 2, DC 6 in same stitch. Repeat dc 6, SK 2, sc, SK 2, DC 6 pattern down underside of foundation ch. The 6 dc will be worked in same st as 6 dc on the top of chain. It is possible that the first "shell/scallop" on top is 3rd ch from hook 5 DC in same st and the ch 2 is counted as a st.